An advocate for oral health, Dr. Vora is a respected speaker at lectures on both local and state levels. 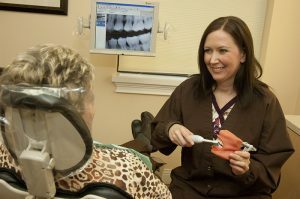 One audience, classroom, or patient at a time, she strives to create more community awareness about maintaining good oral health and preventing disease. An all-digital practice, Vora Dental Care is home to CAESY, a state-of-the-art technology and education resource. With the touch of a key, Dr. Vora can instantly recall 3-D computer animated video to illustrate a patient’s individualized treatment plan. She can also prepare DVDs with take-home care and instructions.